The first step to building a strong crowdfunding project begins with your friends and family. These personal connections are important to the initial stage of your crowdfunding project. They build confidence and trust and impress potential donors that your project is supported. Everyone loves a winner and people want to support success. This first circle of supporters gives your project credibility and traction. Initial supporters indirectly encourage other, unfamiliar viewers to support a project that already has backing. No one wants to be the first, possibly the only, supporter of a project dead in the water! When beginning your crowdfunding project, look to the people who are willing to support you the most: your friends and family! Because your first circle of supporters is comprised of the people that are closest to you, networking and promotion is rather easy compared to crowdfunding from total strangers. This circle is crucial to building the momentum needed to reach the outer circles of potential supporters. Let's look at some effective ways to create momentum in your first circle! These are some of the few people to whom it is okay to walk up and present your project without being treated like a solicitor. Treat your personal connections–with respect, of course! Ask for contributions within their means and explain your cause. If they see that you are taking your project passionately and seriously, they will be inspired to contribute and tell their friends and colleagues. The story of your project will be repeated with love and will give your project the momentum it needs to move forward. There are friends and family that you may not see in person on a regular basis. Even though you do not see them every day, you may ask for their support without hesitation. Comb your phone contact list and leave a message to each person. Make sure you personalize each message. Be considerate. It is okay to take a few minutes to ask them how their lives are going. Give them a chance to ask how you are, and what you are doing. This is the perfect time to inform them about your crowdfunding project! Let them know how much it means to you. Your confidence and passion will inspire them to support you and tell others to support you, too. Your email contact list is a tool to enlarge your crowdfunding project past the first circle of success with great momentum. Send personalized emails to your close friends and family members to connect with them. At this stage of your networking, you are not a marketer or shameless promoter! You are building your project from the inside out. Most personal connections want to help you in some way! Remember that you are not putting them out. If they cannot financially support your cause, encourage them to tell their friends and co-workers. This is an indispensable transition to the second circle of your successful crowdfunding project. While many of your family members may not have social media, some will, in addition to all of your friends whom most likely have social media accounts, too. Connect with every person in your first circle via social media, such as Facebook, Twitter, Instagram, LinkedIn, and more. This will help you establish your online presence and credibility immediately. Not only will social media build your initial supporting base, it will provide you with a jumping-off point from which you may connect with many more people who are outside of your personal connections. Stay tuned for the second circle…. 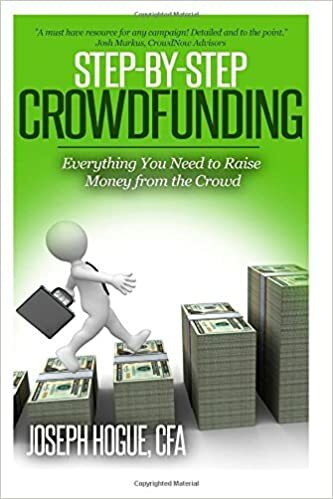 Learn the basics of crowdfunding with this book, Step by Step Crowdfunding: Everything You Need to Raise Money from the Crowd, by Joseph Hogue. This book discusses the importance of diligent research before beginning any crowdfunding project. Hogue emphasizes finding the "magic number" to create a practical, achievable outcome for your campaign. He explains each step carefully with concrete strategies rather than theories. The most important part of this book teaches you how to amass returning followers to your organization. Hogue will teach you how to perpetuate your crowdfunding project for future campaigns, above and beyond the many fly-by-night projects around the world. Do not underestimate the power of your friends and family to help you build your crowdfunding project into a successful campaign around the world. Think of your personal connections as your team members. Allow them to multiply your efforts in networking your project to more people in more communities. Contact our crowdfunding mentor at support@UHelp.com to learn more about crowdfunding your project, or by phone at 888-240-1494. What are you waiting for? Sign up to start a UHelp.com crowdfunding campaign today! I like what you guys are up too. This is clever work and reporting! Keep up the great works, guys. I’ve included you guys to my own blogroll. Thank you for this post, I am a big big fan of this site. Thank you a lot for providing individuals with such a superb possibility to read in detail from this website. It can be very sweet plus full of a great time for me personally and my office co-workers to visit your website thrice every week to read through the fresh items you have. And of course, I am also certainly pleased for the breathtaking secrets served by you. We selected 2 ideas in this article are that are undeniably the most beneficial we have had. I’d forever want to be updated on new posts on this website, saved to fav! I really enjoy examining this web site, it has great content. Hi there! I just would like to give a huge thumbs up for the great data you have here on this post. I will probably be coming back to your blog for more soon. post is written by him as nobody else knows such details about my problem with crowdfunding.